Continuing the vintage Hien theme, S Calhoun 'Cal' Smith's splendid cover for the August 1959 issue of American Modeler magazine depicts a well-known 68th Sentai Tony in unusual camouflage about to bounce a trio of B-25 medium bombers. "The Kawasaki can be colored all light gray with black anti-glare panel forward of the cockpit, or it can be colored all bright green or bright green with splotches of yellow and a hazy blue bottom. The red ball insignia is outlined with a white band only when the plane is camouflaged." Cal Smith's painting depicts the curious yellow and bright green scheme and it is interesting to speculate where this idea for the camouflage may have originated, especially given recent revelations of the yellowish or brownish characteristics of some Japanese 'grays'. In the painting the underwing hinomaru (sun's red disc) also have a white border. There has been much controversy over the actual colours and markings sported by Lt Yoshimitsu Tarui's Ki-61 I Ko of the 68th Sentai's 2nd Chutai captured intact at Hollandia, New Guinea in April, 1944, especially concerning the victory markings that may or may not have been carried by this particular aircraft. Profile paintings, box art and decals have all depicted variations despite the fact that good quality black and white photographs provide multiple views of the aircraft. This particular aircraft has also been attributed to Captain Shogo Takeuchi. Another 68th Sentai aircraft, depicted with blue fuselage and wing command stripes, is attributed to one Captain Akira Onazaki, who is not listed as a Sentai commander or Chutai leader in 'Japanese Army Air Force Fighter Units and Their Aces 1931-1945' by Ikuhiko Hata, Yasuho Izawa and Christopher Shores. 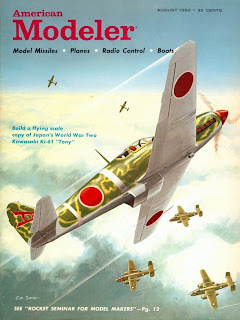 Being a 1/48 modeler (even as a kid) the Monogram A6M5 was about all I had to build....I would see the 1/32 Revell Hien and drool over the box art.....the Raiden as well. Thanks for these postings. The old box art and magazine covers are a treat to see. Great posts Nick, keep it up! This is interesting. Some time ago I have get one book printed in USA in 1945 and it is about the Japan warplanes. It is full color and include a number of the color art. Interesting that all colors are in general bright.